Perched on a ridge above Interstate 280 on watershed land in the Belmont hills, the Crystal Springs cross-country course is a place of extremes. Sweeping downhills, relentless uphills. Stark, exposed, shadeless. Foggy, windy. Always too hot or too cold. Mohamed Abdalla will attempt to make history there Saturday. At the Central Coast Section championships, the Willow Glen senior will try to break a course record that has stood for 33 years. He has broken records before, but not like this. "I've run on courses all over the world," said 1996 Olympian Matt Giusto, a two-time CCS cross-country champ from San Mateo High. "And I've yet to find a more challenging test in a cross-country course. Every time you race it, you don't know what's going to happen." Since it was created in 1972, the 2.95-mile Crystal Springs course has been the measure of every varsity runner from the Peninsula to Monterey Bay. When Mitch Kingery, a junior at since-closed San Carlos High, ran the record time of 14 minutes, 28 seconds in 1973, the course was only a year old. He ran 14:42 or faster four consecutive weeks that year. "As I recall," said Jim Luttrell, Kingery's high school coach, "it was just a thing somebody would break, like most records after a few years." Instead, it has become virtually untouchable. The record board posted on the side of the timer's shed illustrates a course history that mirrors the boom and bust of American distance running. The 15-minute barrier has been broken 75 times, but only 11 times in the past 20 years. The 39 fastest races all were before 1988. In the early '70s, the United States had true distance-running heroes, men like Steve Prefontaine, Jim Ryun and Frank Shorter. The years since have been virtually barren, just like the Crystal Springs all-time list. Crystal Springs historian Michael Elsesser blames a coaching overreaction to high-mileage training. As productive as those 100- to 200-mile weeks were, runners ultimately paid a physically destructive price. But after that realization, training switched from too heavy to too light. Now there are signs of life, with budding stars such as marathoner Ryan Hall and miler Alan Webb finding a proper combination. Also, the Internet gives all runners access to successful training techniques. Abdalla might be a reflection of that resurgence, one that came to the fore two weeks ago when Carlmont crushed the 1980 course record for the best girls team time. Born in Somalia, Abdalla moved to Kenya as a toddler, and came to the United States at 8, first to Minnesota and then to San Jose. He never ran competitively until his freshman year at Willow Glen, and he scoffs at the notion that his East African background is the reason for his success. "People say it's all in the genes," he said. "Genes might help, but I think it's motivation, dedication and hard work. It's perseverance and overcoming all the challenges. That's the key for everybody." Not since the days of Giusto in the early '80s has there been a runner capable of even considering a run at Kingery's mark. Abdalla is the defending state Division III champion. He knows the course, becoming the first since Andrew Hill's Steve Lopez in 1986 to break 15 minutes three times. And he sets high goals, such as winning the national championship. "I'll go for it," Abdalla said. "Some people might think it's not possible. But I think it is." Abdalla said it would require a "100 percent" day. 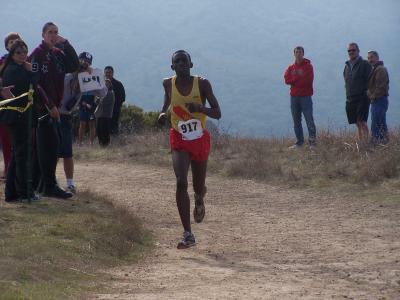 During the Blossom Valley Athletic League finals there last week, Abdalla ran hard and smooth, but grew fatigued late in the race to finish in 14:58, four seconds off his best. "The second and third mile is where you can make a difference," he said. "That's where I think I can break through." Giusto doesn't discount Abdalla's chances, but says he can't be too aggressive. "Don't go in there trying to run a course record," he said. "You'll get yourself in trouble. You have to let the race come to you." Still, it can't hurt to try. "Does he have a possibility of hitting that mark? I think he does," Willow Glen Coach Victor Santamaria said. "I think he understands the odds are against him. But can he do it? Absolutely. I told him he may even crush it."